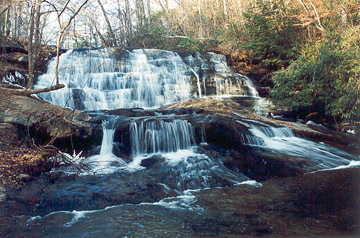 This pleasant 15-foot falls on Carrick Creek can be found about two miles downstream of Table Rock State Park. 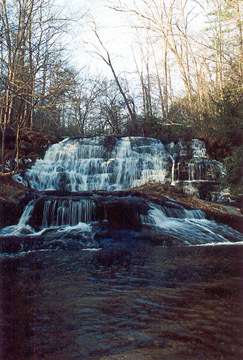 The falls are on private property. Directions: Table Rock State Park is on S.C. 11 near the Greenville-Pickens county line. From the East Gate opposite the park headquarters, go east on SC 11 for .5 mile. Turn right onto Carrick Creek Road and go for two miles. 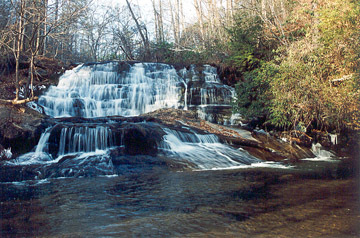 The falls will be on the left .1 mile after crossing the bridge over Carrick Creek.